With you all the way on this. Try Boughton's String Quartet, 'From The Welsh Hills'. Terrific stuff. Guess what. I have that CD (Hyperion), someone gave it to me as a present but I have not listed to it properly. I shall do so. Thanks Mark. The Beeb were forever airing the Sinfonietta, at one time, usually a in-house performance from one of their regional orchestras or the Heward recording, which must sound dated, now. It just sort of went through me without touching the sides but I still went out and bought David Lloyd-Jones Naxos disc and became enthralled. 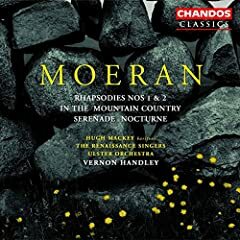 I suspect that he is as good as Bax, perhaps better, in some respects, because, to my ear, Moeran's musical argument is tighter. I have no doubt about who was the more original but they're both fine! It's a "fact" that people either like or dislike Delius with no ground between, so they say! Maybe someone could explain why certain people-of whom I am certainly one(and there are others on this site have such an interest in and love of 20th century British music? It certainly isn't in any way an overtly nationalist thing(I am Scottish anyway) but the quintessentially British/English music of the first half of the 20th century has an appeal which must in some way strike the correct receptive chords in evoking emotions linked to our perceptions of landscape, mood etc related to our native country. Because it's listenable and gently adventurous? ...which is more than can be said for most music composed in the first half of the 20th C. I'm not saying there was no nice music elsewhere but it has to be sought out. I like "The Immortal Hour" very much and there is a charming Oboe Concerto (written for his daughter I think). However, I have been less impressed with RB's symphonies. On a recent Dutton CD I was disappointed with Boughton's "Cromwell Symphony" and much preferred its companion on disc; Edgar Bainton's valedictory Third Symphony. Maybe I'll do a Bainton thread instead! We are getting off the subject of the thread but since it doesn't look we are getting a Rutland Boughton thread-do you know the 2nd and 3rd symphonies? I suspect that you may know the 3rd since Hyperion coupled it with the Oboe Concerto. However there is a BBC Radio Classics CD with Symphony No.2 "Deirde"-(A Celtic Symphony) and Symphony No.3 with the BBC Philharmonic Orchestra conducted by Sir Edward Downes. Both symphonies are attractive and tuneful, if no masterpieces, and much better worked out than the early Cromwell Symphony, which I admit was disappointing. I wonder why the BBC gave up on that series? I managed to collect the Boughton, the Bliss Violin Concerto played by Alfredo Campoli coupled with the Ballet "The Lady of Shalott", the Rubbra 4th symphony(Handley) coupled with the marvellous Piano Concerto(why no modern recording?) and cello Soliloquy(Malcolm Binns and Raphael Sommer respectively), Robert Simpson's Piano Concerto-played by John Ogden no less, coupled with Rawsthorne's 2nd Piano Concerto and double piano concerto in which Ogden is joined by his wife Brenda Lucas, and the Rawsthorne Violin Concerti played by Theo Olof and Manoug Parikian. The series was issued by Carlton Classics and promised to make available lost treasures from the BBC archives. The BBC Legends series is fantastic but does focus on much more mainstream repertoire in classic performances. Anyway, sorry to have strayed so far from Moeran!! I do know the Boughton No 3 but not No 2. BBC Radio Classics got generally very poor reviews. I think that they often deserved better. Like you I collected the Rubbra No 4, Bliss Violin Concerto but also a very good Hymnus Paradisi from Gloucester Cathedral, Morning Heroes with Richard Baker, VW's Pilgrim's Progress adapted for radio, Bantock's Pagan Symphony with Bax Northern Ballads and a v interesting Vaughan Williams Sancta Civitas (a masterpiece) with Symphony 5 (BBC SO Rozhdestvensky)+ Boult conducting Bliss's Music for Strings and Moeran's Sinfonietta (which brings us back to Moeran!!) I think that they now fetch very high prices as they are so rare. Yep, that's the one. Only, I got it dirt cheap as a Helios reissue. What say we just open a single, British 20th century composers thread? Think we had one on the old forum. 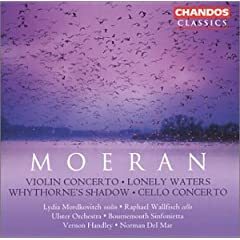 Mark, You would probably like the Moeran cello concerto - the only available recording is Wallfish, but he does a really decent job of this one. IMO its not as good as the Finzi, but its still great. I assume you have heard the Bliss cello concerto...? I've heard neither cello concerto, sadly. The Bliss Piano Concerto, however, I am familiar with. Maybe someone could explain why certain people-of whom I am certainly one(and there are others on this site Smiley have such an interest in and love of 20th century British music? It certainly isn't in any way an overtly nationalist thing(I am Scottish anyway) but the quintessentially British/English music of the first half of the 20th century has an appeal which must in some way strike the correct receptive chords in evoking emotions linked to our perceptions of landscape, mood etc related to our native country. I know that I'm coming late into this thread, but I just want to chime in and say that the G Minor Symphony, for me, is one of the great 20th Century symphonies, and one that I'll never tire of. I'd also rank the Handley over the David Lloyd Jones version on Naxos, but I've not heard the Boult version. For those of you who are interested in another take on this symphony, you might want to check out this live recording with the Shrewsbury Symphony Orchestra conducted by Andrew Rose. It is not a professional recording, but I found it listenable enough, and it was my first introduction to this work. It is also free for download as mp3, as long as you don't try to make money on it. I agree with you about the Symphony and my next favourite work is the Cello Concerto (Boult/Coetmore on Lyrita). I like the newish Chandos reissue with the Cello Concerto and Violin Concerto coupled together (pictured above, with the flock of birds on the cover). 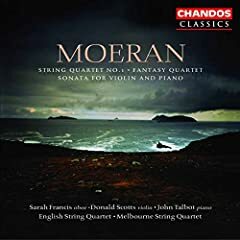 CD below is must buy for Moeran fans. I love Moeran. 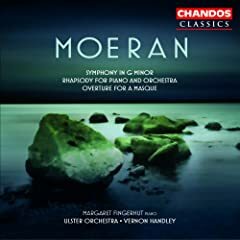 Yes, that Symphony is one of the great poetic masterpieces of the 20th century and among the most moving responses to the First World War, the consequences of which, mentally and physically, Moeran had to live with for the rest of his short life. Yes, absolutely true. The climax of the Cello Concerto is, I believe, Moeran's final statement of the musical ideas which were so dear to him. Very moving, especially in the performance by Peers Coetmore with Boult on Lyrita. Her playing might not be so polished as on the Chandos recording but it is more deeply felt (Coetmore was Moeran's wife). Thanks, jowcol. I'm downloading now. This composer gets mentioned so often I wonder why I haven't investigated him before now. This is my introduction to E. J. Moeran (1894-1950) whom I first read about recently and whose music was described as being firmly entrenched in the "cowpat" school of twentieth century British music, a term derogatorally coined by English serialist composer Elisabeth Lutyens to describe the more idyllically inclined music of Ralph Vaughan Williams, Gerald Finzi, Hubert Parry, and the like. Yes, the music here is nothing if not evocative of British and Irish vistas abetted by frequent none-too-subtle allusions to inherently familiar folk melodies and rhythms. One can choose to either love this music for its simple summonings or be aloof to its seeming ubiquity and triteness; there's certainly nothing threatening nor overtly challenging to be heard. The Violin Concerto of 1937 is probably the most attractive and substantive work here -- three varying movements traversing both a soberly Romantic and homespun musical landscape. Soloist Lydia Mordkovitch produces a somewhat roughhewn sonority, especially in the lower register, but still displays an appropriately sweet-sounding rumination bookending the folksy jauntiness found in the middle movement. In painting this beautiful and amiable picture, she's very well-balanced with the vividly recorded Ulster Orchestra led by Vernon Handley. Handley and the Ulster also perform the near contemporaneous Lonely Waters and Whythorne's Shadow, the latter's namesake being an Elizabethan-era composer -- together representing about fifteen minutes of flowing, lovely, and mostly innocuous musical buffer. The program ends with the Cello Concerto, a later work from around the end of World War II. 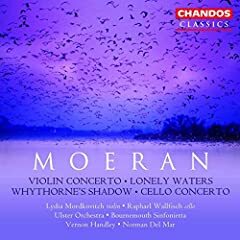 Soloist Raphael Wallfisch is accompanied by the Bournemouth Sinfonietta led by Norman Del Mar in a recording originally released a few years previous to the above in the mid-1980s and compellingly appended here to make for this chock-full 2004 re-release. It's perhaps too easy to say this is musically more of the same as its earlier violin counterpart -- a beautiful and pastorally inspired rumination sandwiching and infused with some lilting Irish folk stylings, this time featuring the deeply rich sonority of Wallfisch's instrument. If, perchance, there's an actual "expression" to be heard in this score, it's mostly latent in this performance, but it melds well with this uniformly peaceable and amiable program -- one, with small effort, I happened to take delight in this particular morning. Next up was EJ Moeran. What does everyone think of Moeran? I think my favorite piece is the "Rhapsody for Piano and Orchestra" on the CD with the symphony. I'm generally more a fan of big orchestral works than the chamber music, but I do like some of Bax's and Arnold's compositions for smaller ensembles. Good thread with interesting, informed comments. I simply wish to add my name on the list of those who recognize Moeran as a significant English composer. Many similarities to Bax, Ireland, Bridge, et. al., which has been acknowledged on the thread. Moeran follows essentially the Delian line more than the Elgarian. Many good works; however, it is the "Symphony In G" which is his masterpiece. Those Chandos discs are unusually well presented - even better than their recent Bax. I hope that this continues, as classical music doesn't need crappy cover art - it simply requires labels who hire professional rather than amateur graphic designers. The Symphony is being performed at the London Proms this year. I'm really disapppointed with the NAXOS cover art for most of the classical CDs that I have.